Alberta Premier Rachel Notley delivers a speech in Ottawa on Nov. 28, 2018. Alberta is planning to buy rail cars by early in the new year to move an additional 120,000 barrels of oil a day out of the province, as it considers calls for production cuts to reduce the supply glut that has driven Western Canadian oil prices to bargain-basement levels. Premier Rachel Notley is under pressure to find alternatives to ship Alberta’s oil amid a lack of capacity on pipelines. In addition to adding more rail-car volume, she is considering providing incentives − including granting breaks on future royalty payments − to companies that agree to cut back production now. She is even looking at mandatory production cuts across the industry. Such measures would reduce supply in a bid to allow market prices for oil to rebound. In a speech in Ottawa on Wednesday, Ms. Notley urged the federal government to support her government’s move to purchase crude cars and locomotives, but said the province will act on its own if necessary and is close to concluding such a deal. She said oil trains would eventually add 120,000 barrels a day of exports, on top of the current 350,000 barrels a day of existing crude-by-rail capacity. Ms. Notley said depressed crude prices are happening “because Canada wilfully holds Alberta’s economy and Canada’s economy hostage” by failing to get new pipelines built. 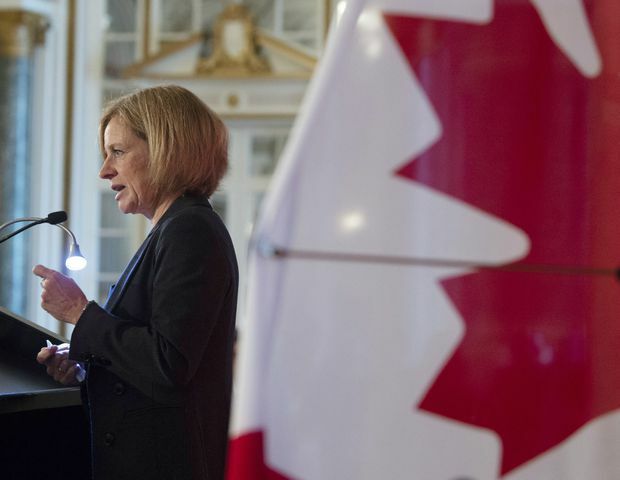 In a letter sent nearly three weeks ago, Ms. Notley urged Prime Minister Justin Trudeau to respond with a sense of crisis to the deep slump in Alberta oil prices and provide financial backing for her plan to buy rail cars. Asked about the funding request on Wednesday, the Prime Minister’s Office directed questions to the Natural Resources Department. A spokeswoman for Natural Resources Minister Amarjeet Sohi said federal officials are working with Alberta counterparts to analyze options − including Ms. Notley’s crude-by-rail proposal − to address the crisis. “We are focused on ensuring that every barrel of Alberta oil gets its full value," Vanessa Adams said in an e-mailed statement. As a result of the lack of pipeline space and rising inventories in Alberta, prices for Western Canadian crude have fallen sharply when compared with the key North American benchmark, West Texas Intermediate (WTI), which has dropped precipitously since early October to close Wednesday at US$50.30 a barrel. Western Canadian Select − which traded at a discount of US$41 a barrel for December − saw the spread narrow on Tuesday to US$33.50 for January delivery, according to NetEnergy, a Calgary-based trading company. Edmonton light crude − which typically sells at a slight premium to WTI − was selling Wednesday at a discount of US$25.25, NetEnergy reported. Alberta’s United Conservative Party Leader, Jason Kenney, turned up the heat on Wednesday on the New Democratic Party Premier by calling on her government to impose a 200,000-barrel-a-day production cut on 13 large producers while exempting small companies from the policy. Those cuts would come on top of the estimated 200,000 barrels a day in reductions already announced by several oil sands companies, including giant Cenovus Energy. The Alberta government is still evaluating whether to impose a production cut or provide incentives to achieve voluntary reductions. It will announce its plan “within the next week or so,” Ms. Notley said. She confirmed that the options include some form of incentives tied to royalty payments, but added that there are many other approaches being considered. The Premier argued that the additional rail capacity would boost Western Canadian crude prices by US$4 a barrel and pay for itself over the course of the next several years before the proposed expansion of the Trans Mountain pipeline is completed. And it would serve as insurance against further pipeline delays, she said. In the House of Commons, the Conservative Party Opposition launched an emergency debate on Wednesday evening, arguing the Liberal government has failed to respond to the crisis that is spreading from Alberta and affecting the economy of the entire country.